Cruises on the Bay™ by Watermark®’s narrated Spa Creek Tour has been cruising the waters of Spa Creek in Annapolis for 30 years and is a favorite cruise for visitors and locals. Watermark is proud to announce the tour has undergone a makeover for historical accuracy and a better customer experience. It should come as no surprise that Watermark works closely with area historians to develop the company’s historical walking tours. Did you know the same commitment and standards are met for the company’s narrated sightseeing cruises? Locally renowned historians Jean Russo, Jane W. McWilliams and history writer Ann Jensen assisted with the tour update. Every day during the Spring, Summer and early Fall, Miss Anne and Miss Anne II takes dozens of guests on a cozy tour of Spa Creek. The cruises’ recorded narration covers the area’s history from the 17th century to the present. As local history evolves and more stories from Annapolis’ roots are uncovered, Watermark updates its products for correctness. Watermark recently invited Russo, McWilliams and Jensen to take the Spa Creek Tour and share their expert knowledge to create an updated version of the tour narration. Jane McWilliams says, “Jean Russo, Ann Jensen, and I enjoyed our tour of Spa Creek aboard the Miss Anne and appreciated the opportunity to help Watermark update the tour narration to reflect the most recent scholarship on the city. I hope residents as well as visitors will get out to enjoy the creek and learn a bit about our city’s history.” McWilliams is a former member of the Maryland State Archives research staff for 17 years. She now concentrates on freelance editorial and research projects. She is the author of several works on Annapolis history. Her most recent book, Annapolis, City on the Severn: A History, was published in 2011. 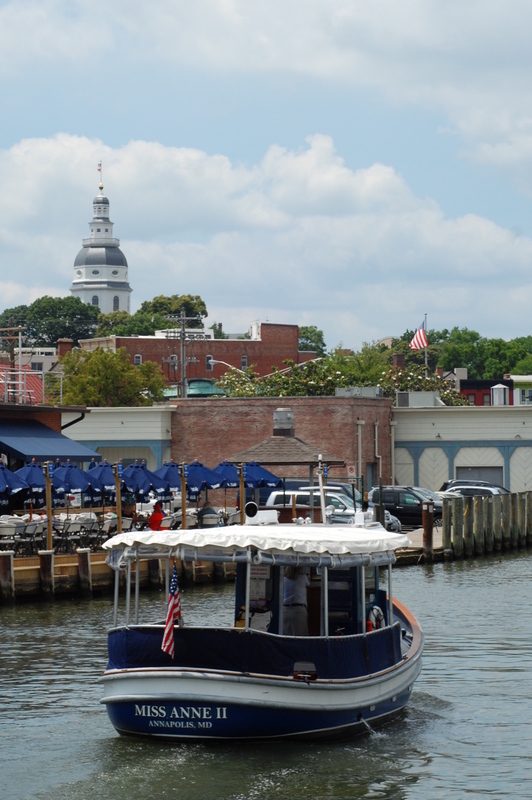 Jean Russo says, “The Spa Creek tour is a terrific experience – an entirely new perspective for appreciating Annapolis and its history. Jane, Ann and I very much appreciate Watermark’s commitment to accurate content for its tours and the opportunity to help update the Miss Anne script so that it maintains that standard. I definitely recommend the tour to Annapolitans and visitors.” Jean Russo is associate general editor of the Archives of Maryland Online, a publication of the Maryland State Archives, and historian for Historic Annapolis. She is the co-editor of The Diary of William Faris: The Daily Life of an Annapolis Silversmith and co-author of Planting an Empire: The Early Chesapeake in British North America. Writer Ann Jensen lives in the historic Sands House, which has inspired her interest in the history of Annapolis and Maryland. She specializes in writing Annapolis, Anne Arundel County and Maryland history. Watermark’s Spa Creek Cruise is currently offered daily by Miss Anne and Miss Anne II. The cruise departs from the Annapolis Harbor and cruises the headwaters of Spa Creek, the residential area of old Annapolis and the banks of the U.S. Naval Academy. Now through Labor Day, the Spa Creek Tour schedule is as follows: Weekdays: 3:30-8:30 p.m. every hour on the half hour, Weekends: 1:15 p.m.-8:15 p.m. every thirty minutes. Tickets are $15/Adults, $6/children 3-11 and free for children 2 and under. Purchase tickets directly from the Captain on the day of your cruise. For more information, visit cruisesonthebay.com.